Since Dhadak posters were unveiled yesterday, praises have been pouring in from Bollywood celebrities especially family members—Shahid Kapoor and Sridevi. At around 5 in the evening yesterday, Karan Johar sent entire Bollywood into a tizzy. 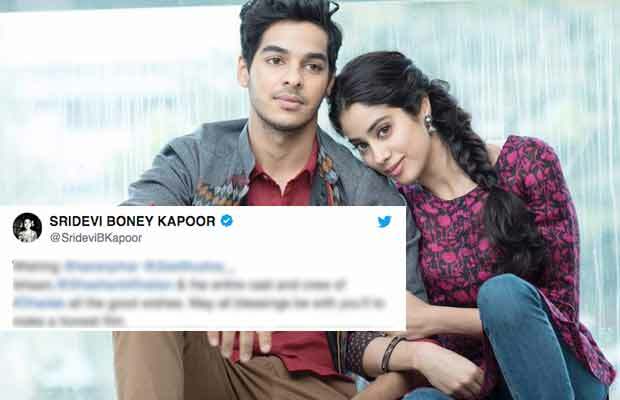 The first of Dhadak posters were unveiled yesterday and since then celebs have gone gaga over Janhvi Kapoor and Ishaan Khattar. The chemistry between the two is so apparent that Bollywood celebrities along with family members Shahid Kapoor and Sridevi could not help but comment on it. Neelima when asked about Ishaan’s foray into Bollywood, she said that she is happy that Ishaan has made his debut at a young age (22) and has arrived with a bang! Directed by Shashank Khaitan, Dhadak is the official remake of Marathi blockbuster Sairat. Dhadak begins its shooting in December and is expected to release on July 6th, 2018. Watch Video: Sara Ali Khan’s Hot Workout Video Gives Us Major Fitness Goals! Next articleBigg Boss 11: Gauahar Khan Blames Puneesh Sharma-Bandgi Kalra For Akash Dadlani’s Behaviour!